What are the consequences of Brexit for Private International Law and International Civil Procedure Law? 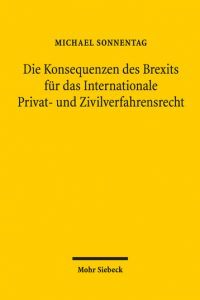 In the very first monograph in German concerning the legal ramifications of Brexit, Michael Sonnentag discusses these questions (Die Konsequenzen des Brexits für das Internationale Privat- und Zivilverfahrensrecht, Mohr Siebeck, 2017). In the first part, the author analyses the possible options after Brexit: the Norwegian model (leaving the EU, but re-joining the EEA); the Swiss model (tailor-made solutions in all fields); the Turkish model (staying in the Customs Union); the Canadian model (free trade agreement); and finally the no-deal Brexit. It is also pointed out that with the British exit from the EU, not only will the Treaty of the European Union (TEU) and that of the Functioning of the European Union (TFEU) no longer be in force in the UK, but regulations and directives will also follow suit. Only in the exceptional case where directives have been implemented in UK Law by acts of Parliament, shall they stand after Brexit. In contrast, it is shown that, if directives have been implemented by Statutory Instruments, the SI’s will fall with Brexit, because the European Communities Act 1972 as their legal basis will cease to exist. Concerning Private International Law, the Rome I as well as the Rome II Regulations will end in the UK after Brexit since they are EU-law irrespective of whether they are kept in force as part of British law. Sonnentag goes on to explain how, in the case of a hard Brexit, there will be an impact on the field of International Company Law: British companies will not benefit from freedom of movement anymore. Therefore, a limited company which had been founded in the UK, but moved its headquarters to Germany – whose courts traditionally apply the so-called seat theory – risks not being recognised in this Member State; consequently, the owner or shareholders could be personally liable for the debts of the company. In the field of International Civil Procedure Law, the Brussels Ia, the Brussels IIa and the Maintenance Regulations will fall in the UK with Brexit. Sonnentag explains that the Brussels Convention will not be revived after Brexit. Furthermore, the Lugano Convention will not be applicable anymore; the UK could join it, but only as a Member State of EFTA or following an invitation by Switzerland, with support from the other Member States. In contrast, the UK could – and should – join the Hague Choice of Court Convention of 2005. Moreover, the effects on exorbitant jurisdiction, jurisdiction agreements and recognition and enforcements of judgments are described in detail. Not only does the monograph outline which rules will be applicable in Germany, but also in the UK. Sonnentag evidences that many benefits in the fields of Private International Law and International Civil Procedure Law will end with Brexit. Furthermore, it is demonstrated that all possible Brexit scenarios will have drawbacks in comparison to a no-Brexit situation. Therefore, according to the author, the best solution for both sides would be the avoidance of Brexit altogether. It is no longer correct to state, as does the Synopsis “In contrast, it is shown that, if directives have been implemented by Statutory Instruments, the SI’s will fall with Brexit, because the European Communities Act 1972 as their legal basis will cease to exist.” By virtue of the recently enacted European Union (Withdrawal) Act 2018, in addition to repealing the 1972 Act, both pre-existing EU-derived domestic legislation and direct EU legislation, however implemented, will be retained in UK law, except in so far as provided otherwise by Statutory Instrument. Since most of the rules used by the E.U. are derived from The Hague Convention and U.N. resolutions this analysis is marked by its omissions. The analysis in its haste to pour cold water on a democratic decision by the electorate in Britain in its final paragraph also entirely forgot the free trade deal with Canada and other convenient trading arrangements with other states that appear to work well. The underlying problem for the Germans is that a major donor is no longer there to fund the dinosaur of an institution that is the E.U. There is no getting away from that yet is absent from this discussion by Sonnentag. Previous post: Call for papers: ‘The Insolvency Regulation Recast: What Has Improved under the New Regulatory Scheme?